This week we look at under-reported stories concerning three of the world's most valuable and most visible companies, and we pay tribute to one of the world's wealthiest investors, whose deal-making and investing acumen was matched only by his discretion. If you're trying to beat the market, you need to develop a variant perception. To do that, you need to focus on situations or information that the consensus view is under-weighting or ignoring altogether. This week we highlight an aspect of Facebook's (NASDAQ:FB) recent challenges that's being under-reported and a valuation guru's experience shorting two of the world's most successful and valuable companies. Finally, we mark the passing of one of the world's wealthiest -- and most discreet -- investors, a Belgian baron who was often likened to Berkshire Hathaway's Warren Buffett. Is it possible that a story concerning Facebook, which can't seem to evade negative headlines, is under the radar? Yes, if the story considers the likely long-term business impact of recent scandals, instead of just engaging in hand-wringing over the short-term price action of the stock. [T]here is no informational edge in most large-cap stocks, but there absolutely is a time-horizon edge for those who are willing to thoughtfully analyze what most people want to avoid out of fear of what the next year might look like. Currently, fear is creating an opportunity with Facebook. ... If you can look out 2-3 years and ignore the day-to-day news, you're likely to see two things: sentiment that has normalized and a business that continues to grow its earning power. If you compare the current price to the powerful network effects, the economics of the business and attractive industry prospects, the risk-reward is outstanding at the current price of $140 per share. I agree, and while I would add that Facebook now faces genuine regulatory risk, I think the current price provides an adequate margin of safety to mitigate this risk and others. Apparently, Huber and I aren't alone. Research firm Morningstar pointed out this week that Facebook is the only stock to make its "Ultimate Stock Pickers" list of top 10 conviction purchases for the second consecutive quarter. The "Ultimate Stock Pickers" are a group of well-regarded fund managers the company tracks for investment ideas, and the managers of the Sequoia, Oppenheimer Global, and Diamond Hill Large Cap funds have all opined that the company's recent challenges haven't impaired its long-term business value. Whether you're a current or prospective shareholder, I recommend you read Huber's note in full. It'll be time well spent, even if you disagree with his conclusion. Here's another under-the-radar story, this one concerning two of the world's largest, most visible companies. On Monday, Professor Aswath Damodaran, the New York University finance professor who wrote the book on valuing stocks -- several books, in fact -- published a blog post to update readers on his shorts of Apple (NASDAQ:AAPL) and Amazon.com (NASDAQ:AMZN). He initially disclosed that he had sold the stocks short in a series of posts in September, in which he explained that the shares were, by his reckoning, overvalued. Both companies had just recently passed the $1 trillion mark in terms of market value. His timing was remarkable, with the stocks down roughly a quarter over the past two months. As one might expect from an academic, Damodaran is extremely thoughtful, but his blog writing is particularly valuable because he brings that analytical rigor to bear on his experience as a practicing investor -- and in real time, no less. He also displays an unusual degree of self-awareness and humility in a field that scores poorly at both. "I got lucky in terms of timing, catching a market correction and one targeted at tech stocks, and I am inclined to believe that is the main reason why my Apple and Amazon positions have made me money in the last two months," he wrote. If you're not familiar with Damodaran's blog, Musings on Markets, I can't recommend it highly enough, it's one of the best resources for investors of all levels. In this latest post, he updates his valuations to $197 for Apple and $1,212 for Amazon. At $168.49, shares of the iPhone maker finished the week at a 14% discount to Damodaran's estimate. Patient, business-focused investors, take note. As far as Amazon goes, you can listen to Damodaran discuss the company at length in this podcast. Albert Frere, a brilliant investor and dealmaker who parlayed his family's local nail manufacturer and ironworks into major stakes in some of Europe's best-known companies, including Adidas and Total, died on Monday at age 92. With a net worth that Bloomberg estimates at $5.7 billion, he was Belgium's richest citizen. Although he was media-shy and lacked a formal education beyond high school, Frere had a nose for value and a talent for networking, fashioning himself into a discreet but extremely influential power broker. He was instrumental in consolidating the steel, oil, and utility industries in France and Belgium during the latter half of the 20th century. Legendary dealmaker Henry Kravis, co-founder of private-equity giant KKR, paid Frere the highest compliment when he told Bloomberg in 2007 that the Belgian's deal to sell a 25% stake in German media group Bertelsmann back to the company for 4.5 billion euros was "probably one of the best [deals] I've ever seen, ever." Frere was often compared to Buffett for his dealmaking and investing acumen, but he didn't amount to the same exceptional "jockey bet" as the Berkshire Hathaway chief executive. 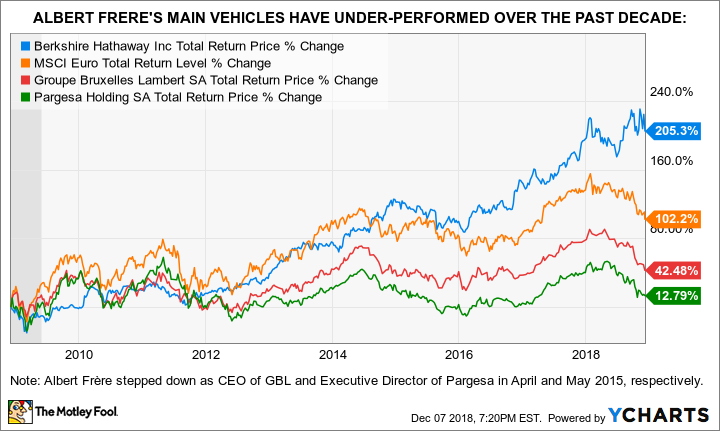 Shareholders in Frere's main publicly traded investment vehicles, Pargesa Holding (NASDAQOTH: PRGAF) and Groupe Bruxelles Lambert (NASDAQOTH: PRGAF), have earned mediocre returns, in part because of the diabolical complexity of his holding companies' structure. BRK.B Total Return Price data by YCharts. Frere stepped down as CEO of GBL and Executive Director of Pargesa in April and May 2015, respectively. Nevertheless, motivated investors will find there is much to learn from studying Albert Frere's remarkable career.